So many big plays. So much space, thankfully, here to savor as many as we could remember in celebrating a staggeringly successful season. Our thanks to the coaches for their input. Enjoy. We are not likely to see anything this endlessly good again. Best Offensive Player: John Lovett had 18 throwing and 13 rushing touchdowns despite missing a game. Finished with a 66 percent throwing percentage, 6.3 yards per carry, and final averages per game were 203.7 yards throwing and 99.3 rushing. Most remarkably, considering Lovett’s nature to not surrender on any play, a thrower who had to improve his accuracy to become a quarterback for all 100 yards tossed only three interceptions. The last FCS player to finish in the top 10 of the Heisman Trophy balloting was Gordie Lockbaum of Holy Cross in 1987. He finished third. Not dreaming here. Just saying. Next Best Offensive Player by Leaps If Not Bounds: Jesper Horsted averaged 14.5 yards per his 72 catches and had 13 touchdowns. Fades, bombs, bubble screens, short slants, posts, with one hand or the conventional two, No. 4 was money, even though NCAA rules prohibited him making a dime. That changes in April. Only once all year did a defender (Mohammed Diakite of Penn) get inside position on Horsted for a pick. Throwing it up for him had all the risk of a kneel down. Best Supporting Actor Since Denzel Washington and Jack Nicholson Have Won Them (And They Did Because We Looked it Up): Stephen Carlson caught 51 passes, five for touchdowns, and made Horsted that much more dangerous. As did Horsted of Carlson, of course. Not only did they provide an alternative threat that made a game plan of all-out double-teaming Horsted foolish but also their exterior blocking on bubble screens and wide runs are additional eye openers on their films before the draft. Second Best Supporting Actor Since Morgan Freeman and George Clooney Have Won Them (and We Looked That Up, too): Sophomore running back Collin Eaddy averaged 7.1 yards per carry for the season. In the one-game absence of Charlie Volker, Eaddy broke a 75-yard touchdown on the first play from scrimmage, one of his three scores, and raced for 266 yards. Best Throw: By Lovett to Horsted for an 81-yard touchdown against Monmouth. Forty-three yards in the air down the sideline to Jesper in unbroken and full stride, with so little separation that he had to stay on his feet through a dive by the defender. Best Throw Under Duress: Blitzer coming, Lovett lobbed the ball off his back foot over Penn corner Conor O’Brien to Horsted for a 42-yard touchdown and a 7-0 lead. Best Bullet Throw: Lovett, his left wrist damaged just a few plays earlier, put a hand burner into Horsted on a 17-yard post for a touchdown against Lehigh. Best Yards After a Catch: Horsted, the meat in a sandwich between two Yale defenders on another perfectly delivered bomb by Lovett, bounced off one high and ran out of the grasp of one low to run the last 15 of a 43-yard touchdown play. Next Best Yards After a Catch: If the second half of six routs became garbage time, they also proved a trash pickers’ treasure trove. Freshman Dylan Classi left a Lehigh defender almost shoeless with a sideline move on a 32-yard touchdown pass from Cole Smith. Best Toe-Tap to Stay Inbounds for a Touchdown Catch: By Carlson at Columbia. Best Toe-Tap Catch to Keep a Drive Going: By Graham Adomitis in the two-minute drill at the end of the half versus Lehigh. Got the ball to the twenty, enabling a field goal. Best Toe Tap to Foil a Drive: Mark Fossati on the interception that secured the Yale win. Best Catches In the Air: By Carlson over Tymere Berry of Monmouth for Lovett’s fifth touchdown throw of the day. Horsted used his body as a shield to go up so high, he still caught in his midsection a nine-yard fade from Davidson against Brown. Best Contested Catches: Horsted wrestled one away from Brown’s Jorquel Condimina for a 39-yard completion from Kevin Davidson on the game’s first play, the start of a seven-play, 75-yard touchdown drive. Best friend a quarterback could ever hope for in his first career start. Horsted also caught a 40-yarder from Lovett against Cornell as the flag was in the air for interference. Best Run by Lovett. On fourth-and-two from the Harvard 33, on Princeton’s first possession, he had half the Crimson going the wrong way with a play fake to Ryan Quigley, then made a cut to leave one defender flatfooted and outran three more. Scored untouched. Next Best Run by Lovett: Columbia had marched for a touchdown to cut the lead to 13-10 when Lovett, on a second-and-ten, executed a play fake, took off left around containment, made the cornerback miss and ran 38 yards to the 30. Best Quarterback Scramble: On that same drive, third-and-goal at the Columbia seven, Lovett rolled for a third pass attempt in three plays but finding nobody open, dodged more New Yorkers than a guy desperate to make a 5:10 train out of Penn Station. His touchdown was overturned on replay, but he punched it in on fourth down and Princeton scored twice more before the end of the half. Lovett had the flu that night, too. Best Short Yardage Run by Lovett: After he was stopped up the middle by Dartmouth on a fourth-and-one at the six on the previous series, two minutes and one drive later Princeton was back at the Big Green five. Out of double tight end set, the quarterback went off left tackle, cut, turned his body sideways to make himself as small as 240 pounds can be and with the help of Brent Holder and Sam Johnson against the best defensive line Princeton has faced in years, squeezed through the smallest of openings to fall into the end zone. Princeton was ahead for the first time in the game and for good. Clutch Touchdown of the Season: See above, although it was scored on second down and a field goal still would have won the game. So, considering the difficulty of the play and the circumstances, we make the case for Horsted’s leaping, over-his-head, snag of a 20-yard touchdown catch from Lovett than extended Princeton’s lead at Harvard to 16-7 with 12:47 to play. Up only 10-7 since mid-second quarter, Tigers had punted on the last four possessions, enabling a good Harvard team to hang around. Somebody needed to make a play and Horsted did on a perfectly delivered throw by Lovett on a post in front of good coverage by Harvard’s Wesley Ogsbury. Best Single Example of the Athleticism Offensive Coordinator Sean Gleeson Had to Play With: At Harvard, Lovett, surprised by an accidental brush by Volker on play action, dropped a snap to his ankles, reached between his legs to keep the ball off the ground and, with a blitzer in his face, threw to Horsted, who made a leaping catch in double coverage for a 50-yard gain at the Harvard 17. Best Team Blocking on One Running Play: There was plenty of room for backs to cut on first-down runs all year long. But Eaddy went untouched on a 66-yard touchdown on a simple quick hitter up the middle against Columbia. Best Block by an Offensive Lineman: How do you pick? But we will venture one. Reily Radosevich pulled to bury Harvard’s outside containment and, with almost every defender caught up in the box, enabled Charlie Volker to turn the corner cleanly and go untouched 49 yards down the sideline for what proved to be the putaway touchdown against Harvard. Best Surprise Play Call and Execution of it: On second-and-goal, Eaddy’s quick flip to Horsted on a reverse enabled him to walk in from three yards out against Cornell. 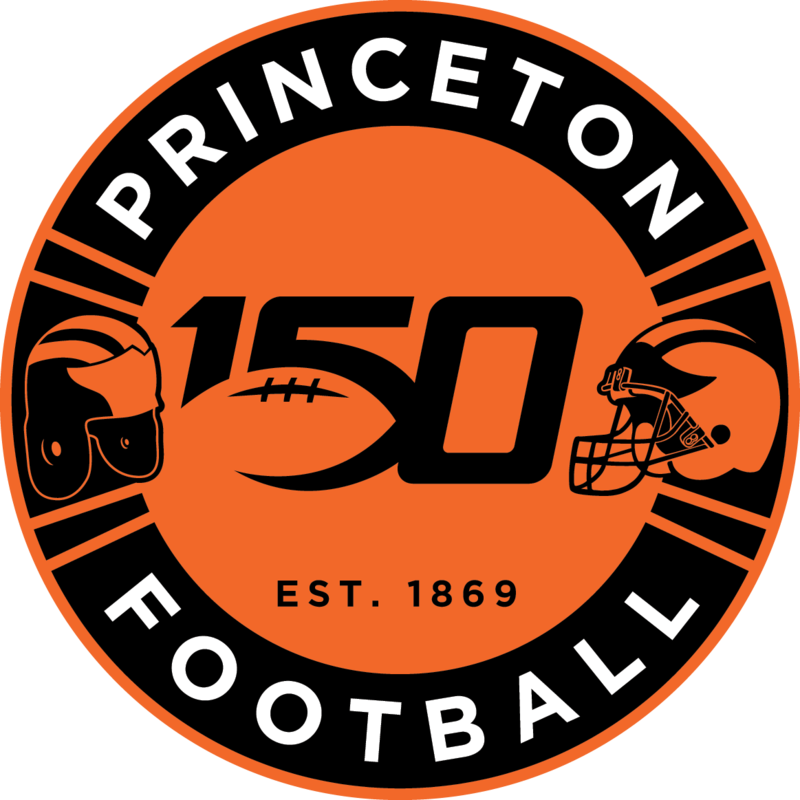 Best Start: Only twice all season (punt vs. Cornell and missed field goal against Penn) did Princeton not score on its first drive. But in the opener at Butler, Lovett, who hadn’t thrown a pass in game competition since 2016, tossed an eight-yard out to Horsted on the first play, then, on the second, perfectly delivered a 63-yarder to Horsted down the sideline for a touchdown. So much for rust. And so much for the yearly disadvantage of opening against a team that already has played twice. After Bob Surace went 0-for-his-first-5, he has won the last four. Best Drive: Ninety-one yards on 23 plays against Dartmouth. Fifteen rushes (without an injured Volker), eight passes, four third-down conversions and one on fourth. Four catches by Horsted, one to get the Tigers off their own four-yard line, one literally snatched out of the hands of Dewayne Terry, and one snagged one-handed. After all that, All Ivy nose tackle Jackson Perry pushed back Alex Deters and penetrated to stop Lovett on fourth-and-one at the five but the Tiger defense held and, with the help of a Tiger Bech return and a Perry facemask penalty, were set up at the Big Green 19 for the winning drive. Best Drive We Didn’t’ Talk About Enough Because of the Previous Two: The first touchdown against Dartmouth. Answered the Big Green’s scoring drive on their first possession with precision perimeter blocking by Carlson, Horsted, Adomitis, Cody Smith on a total of seven quick outs and bubble screens, four of which went to Horsted. Carlson started Lovett’s three-yard touchdown run in motion and sealed the outside so Lovett could cut back. Every inch of 75 yards in 12 plays was hard earned against one of the all-time Ivy defenses. Best Drive to Calm the Jitters, Even if He Never Looked Nervous: Davidson followed up the first play bomb to Carlson against Brown with three more throws to him on a 75-play drive, culminating in a swing pass to Quigley for the touchdown. Best Break: That the one in Lovett’s left wrist could be fixed and protected by a cast. He missed only one game. Best Break in a Game: Dartmouth, leading 9-7, was first-and-goal at the Princeton two in the second quarter when it suffered two false starts before missing a chip shot field goal. You have to be at least a little bit lucky, too, to be this good. Best Second Effort Runs: On the final drive of the season, Volker was completely wrapped up before dragging Penn tacklers an extra four years for a first down. Bob Surace thought it was the coupe de grace for the way Volker, Eaddy and Quigley finished runs all season–and Lovett would have finished more, too, had he not been ordered against it. Considering the circumstances however, our personal favorite was Ryan Quigley’s against Dartmouth. After the Tigers had failed to run out the clock with a four-and-out on the previous series, Quigley pushed the pile an extra six yards on third-and-two to seal the deal. On Balance, the Best Demonstration of Balance of the Year: Quigley, tripped up by a linebacker after he burst up the middle from the Yale 18, put his free hand to the ground to stay on his feet and staggered in for the touchdown. Best Single Game Performance by an Offensive Player: Eaddy’s two touchdowns of 75 and 15 yards in the first minute at Yale started him to a 266-yard rushing day in Volker’s absence. As the Bulldogs chipped away from a 42-7 deficit to make it a two-score game, the start essentially won the contest–and at least a share of the Ivy title. Hard to beat that for a day unless. . .
Best Tour de Forces: Against Penn, Lovett had 255 yards passing and 123 running. Heisman Trophy winner Tim Tebow beat both marks in one game only once during his career at Florida. Just saying. Again. Also against Penn, Horsted caught three touchdowns, ran for another and threw a 28-yard completion to Carlson. It was a pinpoint toss, too, off a catch and release so quick that it could have nailed a base runner at home, which Horsted has done, too. Best Offensive Lineman: Radosevich. “Incredibly reliable,” praises Gleeson. Best Offensive Newcomer: Tackle Brent Holder: Stepped into the cleats of Mitch Sweigart, perhaps the biggest on a left tackle in program history, without a shoehorn. Holder was the primary protector of Lovett’s back on a line that gave up only 10 sacks. Guard Andre Guest and center Alex Deters also were new starters on a unit that anchored the highest scoring offense in Ivy history. Guess they all did okay. Most Precocious Newcomer on Offense: Freshman tackle Henry Byrd. Made the two-deep by the end of training camp. Started Game 10 in Radosevich’s absence. Most Improved Offensive Player Over Four Years: Going to spring practice after his sophomore season, Carlson was just a guy in the mix battling to get onto the field. Here is one last hand to a great developer of hands: When receivers coach Dennis Goldman retired following spring practice, he left one last gift to the program. Best Win: Dartmouth of course. Biggest showdown game in at least two decades and Tigers gutted it out, if barely, against one of the best and certainly the most unrewarded–teams in Ivy history, the (9-1) 2018 Dartmouth Big Green. Best Performances in a Single Game by the Entire Squad: In game two, the Tigers won 51-9 over a Monmouth team that ended up going 8-3. There had not been the slightest expectation of a blowout. Cornell came to Powers Field 3-3 and had played Harvard and Yale four and six-point games respectively and Princeton won 66-0, albeit with the help of four interceptions and a botched punt snap converted into quick points. Big Red managed only 243 yards total offense. Best Two-Point Conversion: Lovett fake run and jump pass to Horsted at Columbia. Hardest Worker on Defense: Tom Johnson. See above, but Ben Ellis and Mark Fossati weren’t even one full bead of sweat behind. Best Single Game Defensive Performance: Jeremiah Tyler at Yale. Interception on Yale’s third play set up a 14-0 Princeton lead before a minute had been played. Covered a fumble by Johnson after an interception on the next series break-up and had a tackle for a loss. His six tackles on the day were a tip of an iceberg of the disruption he caused. Second Best Single Game Defensive Performance: Johnson vs. Dartmouth. He consistently blew up the Big Green’s pulling guards, limiting Jared Gerbino to 2.6 per carry, rushing, a whopping 3.5 below his otherwise Ivy-wrecking average of 6.1. Johnson had 10 tackles in the game. Defensive Play of the Year–It was Fossati’s interception to seal the Yale win after the Bulldogs had crept a little too close for complete comfort with still four minutes remaining. His reading of the play, break on the ball, and toe-tap to stay in bounds after the catch were phenomenal. Can he get another four years as a wide-out? Second-Best Interception: T.J. Floyd, not fooled by a double handoff in the Harvard backfield, leaped at the goalline and went to the ground with the ball to take a touchdown pass away from Jack Cook. Best Season-Saving Defensive Play: Two Dartmouth receivers were open behind coverage for a go-ahead score in the fourth quarter when Mike Wagner got to quarterback Derek Kyler on a third-and-six. Big Green had to punt with five minutes remaining. High wire save by a high motor guy. Best Defensive Game by the Team. Dartmouth. After recording six first downs on a game-opening drive, the Big Green had only seven more the rest of the game, none in the last five series. In the game of their life, Tigers played the games of their lives. Best Hit: On one of those final five failed attempts, Dartmouth had a second-and-two when Tyler knifed in to bury Rashaad Cooper on a swing pass, setting up long yardage. Best One-on-One Tackle: See above, unless it was Tyler again, tripping up Charlie Booker on a fourth-quarter fourth-and-one at Harvard. Best Two-on-One tackle: T.J. Floyd and Jake Strain wrestled down Cooper at the two to save a touchdown and what would have been a 16-7 Dartmouth halftime lead. Best Three-on-Three Tackles: Dartmouth was buried on two third-and-three screens that epitomized the team-wide defensive effort that day. Best Strip: Wagner’s at Columbia wins on style points. Exactly the way they teach it. But for importance, it was T.J. Floyd’s rundown of Harvard’s Henry Taylor from behind and punching the ball out, enabling a Strain recovery. Greatest Hustle Play by a Defender: Second play of the game, Monmouth’s Pete Guerriero, a 100 and 200-meter track champion, got outside and was gone until he wasn’t. Ben Ellis didn’t quit, running Guerriero down after 71 yards at the Princeton 12. Hawks settled for a field goal. Most Improved Player on Defense Over Four Years: Ellis. Pretty much another guy in the mix going to his junior year, he emerged as one of the team’s surest tacklers and as the vocal leader of the secondary. Took the need for better communication back there to his oversized heart. Had four tackles on blitzes and an interception. Second Most Improved Player over Four Years: Strain, undersized and underestimated, went to the weight room to pump himself into one of the best run stoppers in the Ivies. Most Improved Defensive Player of the Year: After being lost to injury late in the 2017 season, Jay Rolader became a starter this year after Kurt Holuba’s season ended just before the opener. Proved he was ready with a strip at Butler that set up a touchdown and he became the Tigers’ best interior lineman. One-on-one, he didn’t lose. Best Newcomer on Defense: Freshman Christian Brown stepped into the starting lineup soon after All Ivy corner C.J. Wall was lost for the season and proved precocious. But sophomore Sam Wright essentially was a newcomer, too, following sparing usage as a freshman and emerged as a coming pass-rushing star with two memorable rundown sacks of elusive Brown quarterback Michael McGovern. Best Special Team Play – Tiger Bech made the first guy miss, then spun out of two more tackles on a 39-yard punt return against Harvard. Best Special Teams Player: Bech added more tough yards, averaging almost 11 per touch, without a muff all season. Most Useful Special Teams Player: Senior Jordan Argue. His chances at receiver pretty much buried by the weaponry of Horsted, Carlson and Bech, Argue excelled on all four special units. Best Tackle on Special Teams: By Argue on Butler’s Kavon Samuels on the second kickoff of the season. Clean, hard and sure in the open field. Most Aggressive Player on Special Team: Jim Johnson, chip off his block of his older brother Tom. Best Special Team Leader: Eli Stern, mostly by example, according to Special Teams Coordinator Stephen Thomas. Stern asked good questions in meetings and set a tone with his purposefulness and studiousness. Hugely liked and respected. The badly broken leg Stern suffered at Yale, ending his season a game early, broke a lot of hearts in the special team room. Kick of the Year: Tavish Rice put a kickoff through the goal posts at Yale. Princeton was not given three points, however, which didn’t seem right. Rice also booted one into the stands in a home game. Best Newcomer on Special Teams: Sophomore Nico Ramos got the placekicking job as Surace decided not to overwork the recuperating incumbent Rice. Ramos earned the right to keep it. He missed only three PATS in 61 attempts and made seven-of-nine field goal tries. Best Newcomer on Special Teams, Grunt Division: Freshman Harrison Caponiti, who earned his way onto the field at mid-season, got a piece of two opposition punts. Biggest Frustration of the Season: It took 54 years to produce another undefeated season and it will be longer than that to find another one as virtually frustration-free. Against Dartmouth, Lovett threw an end zone interception, suffered a fumble, and was trapped for a safety but never let the Big Green see him sweat. Only Times the Tigers Ever Looked Like 18-22 Year Olds: Three penalties on one first quarter drive killed an excellent opportunity to go up two scores and loomed ominously when Harvard was down only 10-7 into the fourth quarter. And later that same day there were some communication snafus in the defensive backfield that forced Princeton to twice recover onside kicks. Plus, there were some blocked PAT’s. So sue them. Our outstanding remembrance of the 2018 Tigers will not be not just how they were overwhelming but almost as flawless as a team could be. Four of the games had to be won in the second half and the Tigers rose to every occasion. And that’s a tribute not only to the coaches. Most Inspirational Guy. Ever: Three days after devastatingly losing his senior season and a shot at the NFL–following months of grueling rehabilitation–Holuba stood before the team in a breaking voice and announced the goal still at 10-0 and vowed he still would be there for this defense in any way he could. His instruction as a defacto coach of a young line was for anyone at practice to see, but his advice and encouragement behind the scenes was an untold story of a legendary season.